Every day we are bombarded with hundreds of decisions and it’s impossible to make sound, rational choices at every turn. Instead of logic, we often rely on emotions, or our gut instinct. A great example is in your inbox. It’s impossible to read every email so you skim, mass delete and read only the emails that pique your interest or demand your attention. With emotions playing such a large role in decision making, it would be foolish to ignore psychological factors that might influence opens, clicks and conversions. 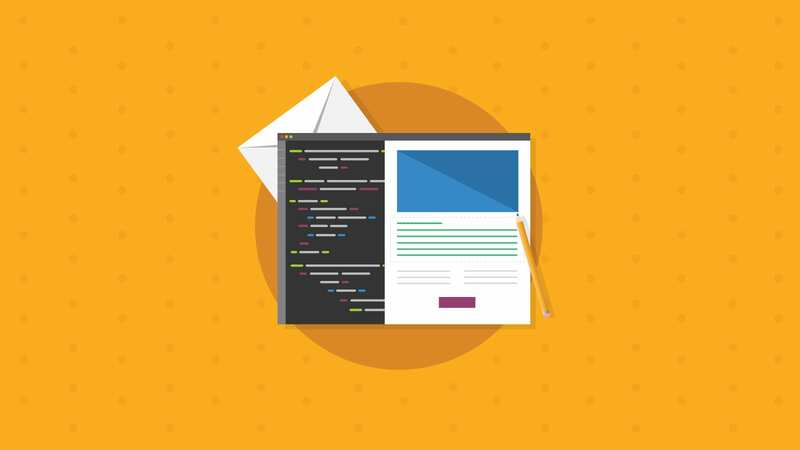 Understanding these five basic tactics arms you with the ability to create emails with a “wow factor” that gets results. Color elicits emotional responses from individuals. If you know what emotion you are trying to evoke for a conversion, understanding the psychology behind particular colors can be an incredibly useful tool. 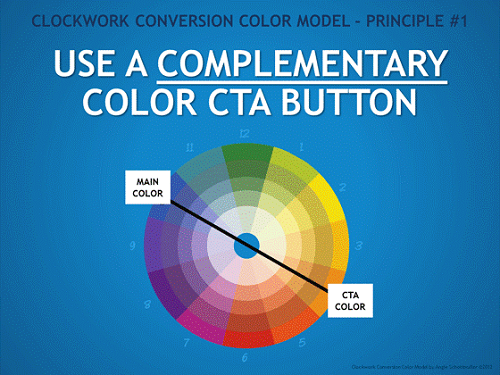 THREE DEEP made a fantastic clockwork conversion color model laying out how to use all the colors in your email or landing page in unison for maximum effectiveness. From the model above, you can see that not only picking the right color for your email or landing page is important, but then you must be picky when choosing the other colors in your email, say the CTA color, to ensure it compliments your main color choice. From the graph above, you can see that if you have a blue background, an orange CTA is recommend to maximum conversions. Choosing the right color can have a great impact on the success of your campaign, but it’s important to remember that color is very dependent on personal experiences. So test, test and test again to uncover the color that will speak the strongest to your audience. The old saying, “a picture is worth a thousand words,” still rings true in the art of email marketing. Why? Just like color can elicit certain emotional responses from your reader, so can images. And about 80% of your audience is scanning your email anyway—not actually reading it word for carefully chosen word (we’re sorry)—so a relevant image is crucial to get your message across to the on-the-go reader. When deciding what images to use in your email, one type will always resonate: images of people. Images of faces are processed in the “fusiform face” area of the brain, which also processes emotional responses. These images allow your reader to create an emotional connection with your content and brand. When using people in your image, use visual cues for optimal placement. There are two types of visual cues you can leverage: Explicit and implicit directional cues. Explicit directional cues are obvious: fingers or arrows pointing to the CTA. They exist to draw your attention directly to the form or CTA. An implicit directional cue is less obvious and might, like in the example below, have the subject looking at the CTA rather than pointing to it. This is a more casual and subtle visual cue but still will get the job done. 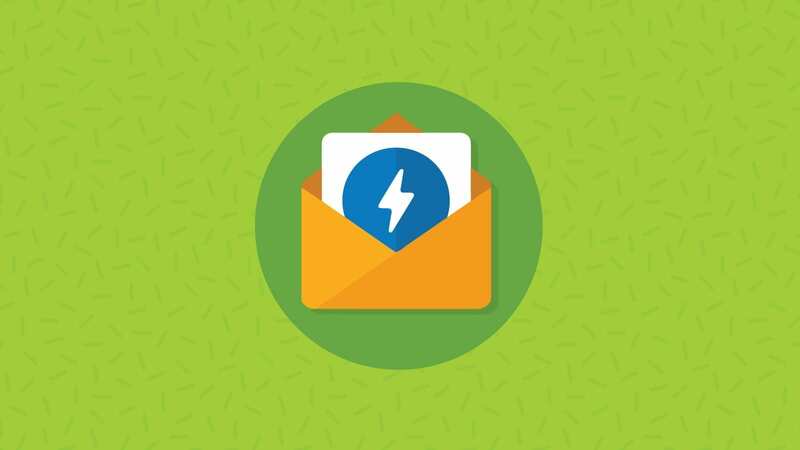 In Emma’s Brainiac Guide to Using Images in Email, other tactics to remember when leveraging images in email are to put an image above the fold, create a consistent look and design buttons for mobile. Never underestimate the power of personalization in your email efforts. Experian Marketing Services found that personalized emails deliver 6x higher transaction rates. 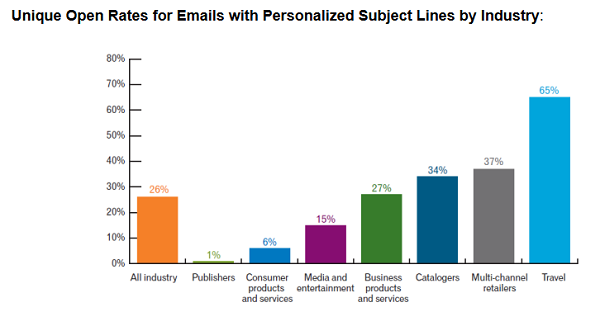 Additionally, Experian found that personalized subject lines result in a 26% higher open rate. Personalization options don’t end with just using your recipient’s first name. Have you considered creating marketing personas? Once you have an understanding of your buyer personas, you can segment and tailor your content based on them. Aberdeen found that personalized emails improve click-through rates by 14% and conversion rates by 10%. So what are you waiting for? In email marketing, social proof is a must. Sure, you have an incredible offer (product, service, etc. ), but you need real people singing your praises to convince other real people. 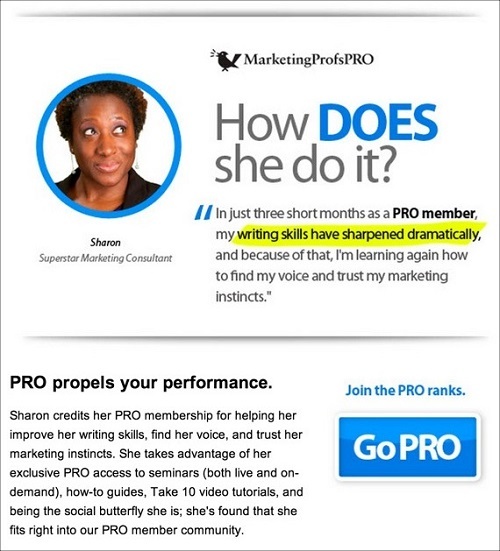 Below, MarketingProfs did a great job with a customer testimonial, using a case study like-example to show what a PRO membership can do for an individual. 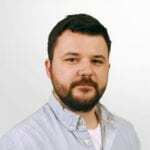 Exclusivity or scarcity can be a very powerful motivating factor when it comes to email conversions and can be executed as a time-based or limited supply call to action. You probably see scarcity marketing every day and don’t even know it. Take for example, Groupon, who utilizes the scarcity concept as a part of its core business model and in each email campaign sent. 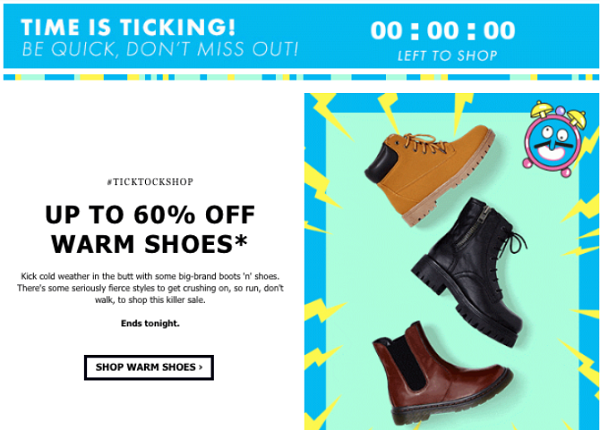 In the email below, Asos does a great job of interweaving scarcity into all the elements in the email. They use the theme of time in the text and even have a clock in the upper right hand corner showing how much time the shopper has left. No one likes to think they missed out on something big, so leverage scarcity in your next promotion to increase your conversions. Don’t overdo it, though. You don’t want to desensitize the psychological power of this tactic. 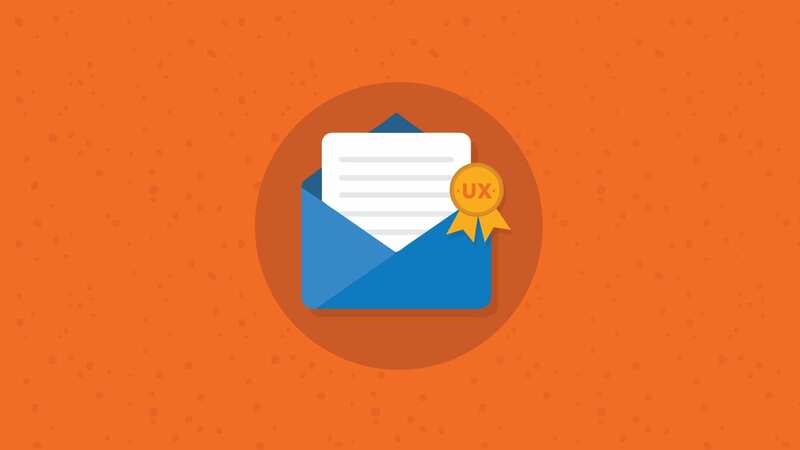 What are your favorite psychological principles to leverage in your email campaigns? Share them with us in the comments below. Analyzing those colours is very pretty easy, as an excessive number of movies use blue+orange, because humans of all races have basically orangy skin and blue is the complementary color, so the combination is impactful. Seems pretty good evidence against the theory. You make some really good points and thanks for those links you shared. I must admit, I never noticed how almost every movie poster was orange and blue. One thing I do want to re-emphasize here is that the emotions a color elicits is very subjective to the individual viewing the color. Past experiences can significantly alter someone’s emotional reaction to a particular color so when dissecting what color means globally, it’s hard to make any sort of blanket statement. In my piece, I found color charts to support general emotions towards color but it was by no means an absolute statement that will apply to everyone. I encourage you to test, though, and see if mixing up your color palette in emails makes a difference. 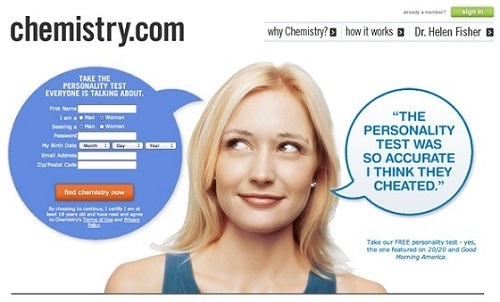 We can theorize all we want, but won’t know what works for our particular audience until we run some tests ourselves. Mallory, I’m curious about your take on the psychology of the colors, such as in the buttons. While the psych portion suggests an emotional rationale behind a specific button color (as in the graph) it might also just be a matter of going with a complementary color. Do you think there’s something to the actual color? For example: starting out with a desire for a green button leads to a red/purple scheme for the rest? In my opinion, I do believe there is something to the actual color. I think it’s important to first consider the psychology behind the color of your CTA (and ensure the emotions behind this color elicit the response you’re looking for), then pair the complimentary colors appropriately. I hope that helps! Remember, though, every audience is different so be sure and test your CTA color to see what is most effective for your particular audience. Mallory, thanks for the usefull information. We have chosen the color orange in our house style, because in the Netherlands it’s the color related to our Kingdom, because it’s a member of the “Van Oranje”famlily ( means Orange famliy). So orange isn’t related to agressive attitude but more like trust and recognation and (R)Loyalty.